In order to survive in low nutrient environments, most microorganisms compete with each other to get their best niche, which will allow them to grow and produce progeny. Many different strategies where adopted by microbes to withstand the competition. Some of them evolved to grow in harsh environments with a naturally reduced number of competitors i.e. thermophiles or acidophilic microorganisms. However, what do those microbes do which are growing in normal conditions with thousands of other species fighting for food? Through millions of years of evolution, microbes have developed several systems to successfully survive in challenging environments. One of those interesting survival mechanisms has evolved in yeast. The ethanol production by most crab tree positive yeasts confers an advantage against ethanol sensitive microbes, thereby allowing yeast to grow effectively in carbon rich environment. However, this mechanism does not work against other crab tree positive yeast species or fungi, which are inhabitants of the same niche. In the early 1970s, scientists started to get insight into yeast virology and found that certain Saccharomyces cerevisiae (commonly known as wine or baker’s yeast) strains secrete protein toxins that are highly lethal to sensitive S. cerevisiae strains. The phenomenon was called “killer yeast” and the toxin that they produce was called “killer toxin”. Interestingly, further studies revealed that the “killer yeast” phenomenon is not limited to S. cerevisiae, but frequently found in other yeast and fungal genera. The killer strains are immune to their own toxin, but susceptible to toxins secreted by other killer yeasts. This phenotype in yeast provides substantial advantage in competition with sensitive yeast strains in natural habitats where nutrients are limited (Magliani et al. 1997). So how do yeasts secrete toxins? The discovery was made while working with brewery contaminating S. cerevisiae. Further investigation within the past three decades showed that the killer phenomenon has different origin. In S. cerevisiae, the killer phenotype is expressed by cytoplasmic double-stranded RNA viruses of the Totiviridae family. However, the killer phenotype in some yeast species can be attributed to double-stranded DNA plasmids and chromosome genes, therefore suggesting that yeast species evolved differently to produce the killer toxin with the aim to withstand natural selection. The killer phenomenon is well characterized and studied in S. cerevisiae, thus we will briefly discuss the mechanism of the phenotype and its possible applications on the basis of baker’s yeast (Schmitt and Breinig 2002). As mentioned before, the killer toxin is produced by yeast containing intracellular non-infectious dsRNA viruses. Interestingly, the dsRNA virus causes no harm for the yeast host and has solely vertical transmission during mating and budding. Up to now, three major S. cerevisiae dsRNA virus types have been discovered and characterized. All three differ in toxin type produced and self-protecting immunity mechanism (Table 1). Each killer yeast phenotype requires coexistence of two different dsRNA viruses. Each virus implement its own role: An L-A virus, also called helper virus, contains two open reading frames – the first one encodes a capsid protein (Gag), required for viral capsid formation and the second one encodes an RNA dependent RNA polymerase (Pol), required for viral dsRNA replication. An M-virus, also called killer virus, contains only one open reading frame that encodes preprotoxin (a mature toxin precursor). 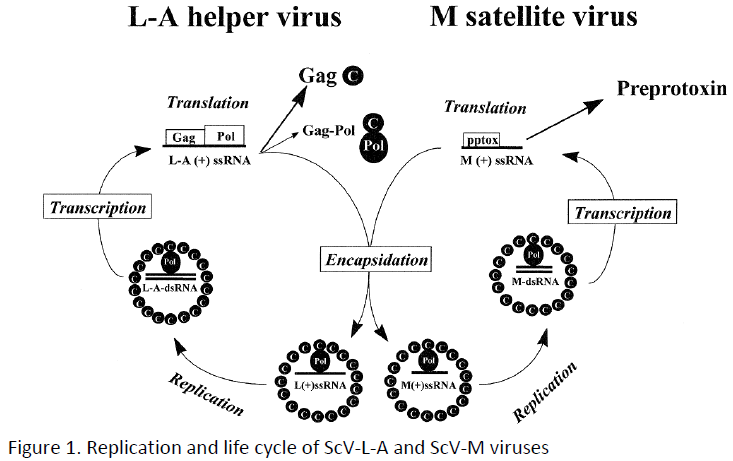 The existence of the M-virus is totally dependent on the presence of the L-A virus. However, the self-protecting immunity mechanism depends on the presence of the M-virus. Therefore, to maintain the killer phenotype, yeasts need to have both types of viruses (Schmitt and Breinig 2006). As any virus, the yeast L-A and M viruses exploit the host’s translation machinery to produce proteins for virus capsid assembly, dsRNA replication and toxin synthesis. However, dissimilar to other viruses, the yeast virus presence in the cell is symptomless (causes neither growth disadvantage nor death of the cell). Figure 1 shortly depicts the life cycle of the yeast viruses. Among proteins produced by the viruses, preprotoxin proteins have a unique structure. The newly produced protein consists of several domains and signal sequences, which allow it to be correctly processed and secreted by the host’s secretary pathway. 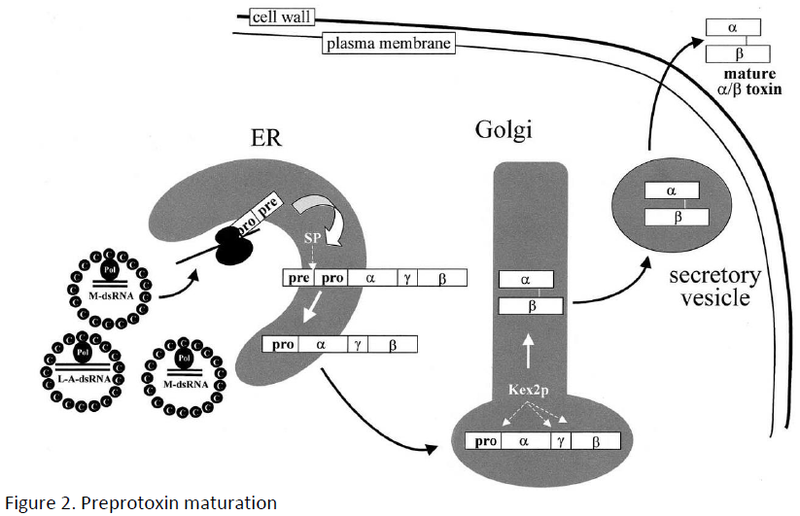 As you can see in figure 2, the preprotoxin maturation requires the host’s protein processing machinery consisting of endoplasmic reticulum and Golgi apparatus. Viral killer toxins kill sensitive yeasts by interacting with specific receptors on the cell wall and the membrane. In case of the K1 toxin, it binds to specific cell membrane receptors and disrupts the membrane structure, which leads to cell death. However, the K28 toxin enters the cell by endocytosis and acts intracellular by inhibiting DNA synthesis in the nucleus (Figure 3). Interestingly, the presence of preprotoxin is essential for a functional immunity against mature toxins. However, the precise mechanism of self-immunity still needs to be investigated. Several hypotheses suggest that preprotoxin acts as competitive inhibitor of plasma-membrane receptors which are responsible for mature toxin uptake (in case of the K1 toxin), or preprotoxin protein rapidly forms a complex with the taken up mature toxin which loses its toxicity and becomes a target for proteasome degradation (In case of the K28 toxin) (Schmitt and Breinig 2002). The killer yeast phenomenon is still being studied and some aspects of its biology already found a practical usage in modern biotechnology applications. For example, the killer phenotype can successfully be exploited in wine industry. In wine fermentations, microbial spoilage is a frequent problem, which can compromise the final product quality. In order to reduce contamination by spoilage yeasts and bacteria, grape must is chemically treated with sulphur dioxide, but current trends dictate to use less chemical additives (Lopes et al. 2007). Therefore, usage of starter S. cerevisiae strains with the killer phenotype is being advanced and exploited. Moreover, toxins produced by killer yeasts (including non-Saccharomyces yeasts) have broad antifungal activity and can be used as antifungals (Buzzini and Martini 2001). A few applications are mentioned in this article where the killer yeast phenomenon can be exploited, but there are a lot of other potential applications that are currently being studied and developed.